If you have questions regarding the ream and run procedure, feel free to email Frederick A. Matsen III M.D. at matsen@uw.edu. A common cause of posterior dislocations and posterior instability of the shoulder is the loss of the rim or lip on the back of the socket of the shoulder joint. The posterior glenoid concavity can be restored by a procedure known as posterior glenoid osteoplasty. The normal shoulder is a marvel of mobility and stability. It provides more motion than any other joint in the human body yet the humeral head (ball of the shoulder joint) remains precisely centered in the glenoid (the socket of the joint) throughout the wide range of shoulder activities. 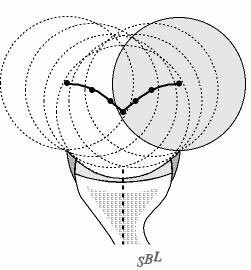 One of the main stabilizing mechanisms is concavity compression in which the head of the humerus is held into the glenoid concavity by the action of the rotator cuff (much like a golf ball is held into the concavity of a golf tee) (see figure 1). 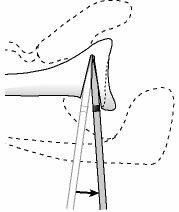 Because of this concavity the humeral head must rise up over the glenoid lip before it can translate out of the socket. 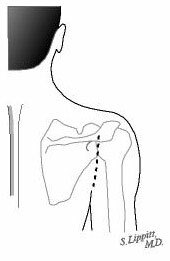 The path taken by the humeral head during this translation is called the "glenoidogram" (see figure 2). 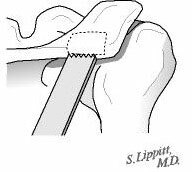 When the rim at the back of the socket is underdeveloped or worn the humeral head can translate out the back of the joint more easily without having to lift up over the rim. In this situation the glenoidogram becomes flattened (see figure 3). When recurrent posterior instability or dislocations interfere with the comfort and security of the shoulder and when these symptoms cannot be controlled by other means a posterior glenoid osteoplasty performed by an experienced shoulder surgeon can usually restore the stability of the joint (see figures 4 and 5). Posterior glenoid osteoplasty can help restore the function and comfort of shoulders that are unstable posteriorly. The goal of posterior glenoid osteoplasty for recurrent posterior instability is to restore the depth of the back of the shoulder socket or glenoid. This is accomplished through a posterior approach that does not require any muscles or tendons to be detached. This procedure cannot be accomplished arthroscopically. The incision is made in the normal skin creases around the shoulder leaving a minimal surgical scar (see figure 6). If the stability is lost because of a deficiency in the posterior glenoid lip posterior glenoid osteoplasty can help restore stability by building up this lip. When performed by an experienced shoulder surgeon posterior glenoid osteoplasty has an excellent chance of restoring stability to the shoulder. This procedure is particularly valuable in patients who have stretchy or thin ligaments and those who have failed previous surgeries. Who should consider posterior glenoid osteoplasty? Posterior glenoid osteoplasty is considered for patients with recurrent posterior instability or feelings of unsteadiness or apprehension that have not responded to a well-conducted rehabilitation program. 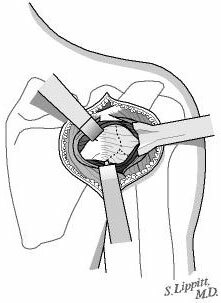 A number of different surgical procedures for recurrent posterior glenohumeral instability have been described. These include arthroscopic suturing burning the inside of the capsule with laser treatment or with radio frequency heat probes as well as open surgical tightening of the capsule. None of these procedures restores the posterior lip of the socket. All of these procedures are at risk for failure if the ligaments and capsule are thin stretchy or weak. None of these procedures provides a robust augmentation of the posterior glenoid lip. Posterior glenoid osteoplasty has the advantages of providing a robust change in the stabilizing geometry of the shoulder. It does not depend on healing of compromised ligamentous tissue or a predictable response to thermal energy. In the hands of an experienced shoulder surgeon posterior glenoid osteoplasty can help restore to the unstable shoulder some of its lost comfort and function. With a good rehabilitation effort and with the avoidance of additional injuries the result of the surgery should last for a long time. Surgery for instability is not an emergency. Posterior glenoid osteoplasty is an elective procedure that can be scheduled when circumstances are optimal. The patient has time to become informed and to select an experienced surgeon. understand the postoperative rehabilitation program. Posterior glenoid osteoplasty should be performed when conditions are optimal. Particularly in the case of atraumatic instability an extended effort at non-operative management is suggested. Usually a 6- to 12-week try at strengthening exercises is sufficient to determine whether exercises are likely to be effective. There are also risks associated with anesthesia including death. An experienced shoulder surgery team will use special techniques to minimize these risks but cannot totally eliminate them. Many of the risks of surgery for instability can be managed effectively if they are promptly identified and treated. Infections may require a wash out in the operating room and subsequent antibiotic treatment. Blood vessel or nerve injury may require repair. Stiffness may require exercises or additional surgery. Persistent instability or arthritis may require the consideration of additional surgery. If the patient has questions or concerns about the course after surgery the surgeon should be informed as soon as possible. Posterior glenoid osteoplasty is considered for healthy and motivated individuals in whom recurrent posterior shoulder dislocations or apprehension interfere with shoulder function. Successful posterior glenoid osteoplasty depends on a partnership between the patient and the experienced shoulder surgeon. The patient's motivation and dedication are important elements of the partnership. Patients should optimize their health so that they will be in the best possible condition for this procedure. Smoking should be stopped a month before surgery and not resumed for at least three months afterwards--ideally never. This is because smoking interferes with healing of the repair. All heart lung kidney bladder tooth or gum problems should be managed before surgery. Any infection may be a reason to delay the operation. The patient's shoulder surgeon needs to be aware of all health issues including allergies and non-prescription and prescription medications being taken. Some of these may need to be modified or stopped. For instance aspirin and anti-inflammatory medication may affect the way the blood clots. The skin around the shoulder must be clean and free from sores and scratches. Before surgery patients should consider the limitations alternatives and risks of surgery. Patients should also recognize that the result of surgery depends in large part on their efforts in rehabilitation after surgery. The patient needs to plan on being less functional than usual for up to twelve weeks after the shoulder repair. Lifting pushing pulling and some activities of daily living can place stresses on the repair. Performing usual work or chores may be difficult during this time. Plans for necessary assistance need to be made before surgery. For people who live alone or those without readily available help arrangements for home help should be made well in advance. The shoulder surgeon should answer any questions about the surgery or the recovery period. Posterior glenoid osteoplasty can be delayed until the time that is best for the patient's overall well being. Posterior glenoid osteoplasty is a technically demanding procedure that is ideally performed by an experienced shoulder surgeon in a medical center accustomed to performing these procedures at least several times a month. Patients should inquire as to the number of posterior glenoid osteoplasties that the surgeon performs each year and the number of these procedures performed in the medical center each year. Surgeons specializing in shoulder instability surgery may be located through university schools of medicine county medical societies state orthopedic societies or professional groups such as the American Shoulder and Elbow Surgeons Society which offers a worldwide directory of shoulder and elbow surgeons on its web site. Posterior glenoid osteoplasty is often performed in a major medical center that performs these procedures on a regular basis. These centers have surgical teams and facilities specially designed for this type of surgery. They also have nurses and therapists who are accustomed to assisting patients in their recovery from this type of surgery. the infraspinatus and the teres minor. 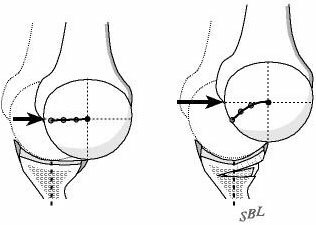 parallel to and one centimeter medial to the articular surface. of the glenoid in the plane of the intended osteotomy. anteroposterior dimension of the glenoid. medial to the glenoid lip in the same as the face of the glenoid articular surface. The depth of the osteotome is controlled by paying attention to the sterile tape mark. as the osteotomy is deepened to prevent penetration of the joint surface. Posterior glenoid osteoplasty is a highly technical procedure; each step plays a critical role in the outcome. The goal is to perform this surgery without detaching muscle or tendons--this "rotator cuff on" approach speeds the recovery because strengthening exercises can be started right away after surgery. After the anesthetic has beena dministered the patient is placed prone on the operating table and the shoulder has been prepared a cosmetic incision is made in a natural skin crease at the back of the shoulder (see figure 7). This incision allows access to the seam between the posterior and middle thirds of the deltoid (see figure 8). Splitting this seam allows access to the rotator cuff muscles without detaching or damaging the important deltoid muscle which is responsible for a significant portion of the shoulder's power (see figure 9). All scar tissue is removed from the space beneath the deltoid. 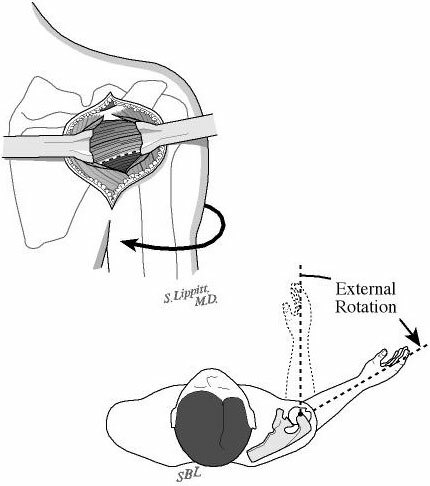 The posterior rotator cuff muscles are relaxed by passive external rotation (see figure 10). The interval between the infraspinatus and the teres minor is split leaving the teres minor between the split and the axillary nerve (see figure 11). 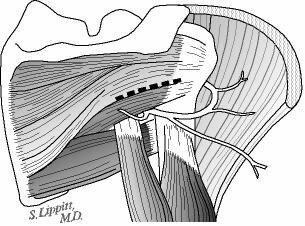 This split is opened without any tendon detachment providing excellent exposure of the posterior shoulder capsule (see figure 12). The capsule is incised horizontally (see figure 13). 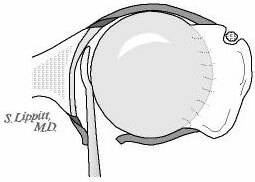 If there is a weak area of capsule the incision is made through it so that it can be reinforced at the time of closure. A blunt elevator is inserted to indicate the plane of the joint (see figure 14). 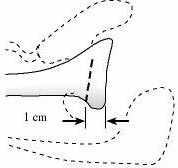 The posterior glenoid bone cut is planned one centimeter medial to the joint surface and parallel to it (see figure 15). A drill hole is made in the plane of the intended cut and the depth of this hole is measured. The osteotome is marked with sterile tape at a distance equal to three fourths of the depth of the glenoid at the osteotomy site (see figure 16). 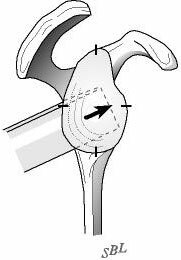 The osteotome is driven into the glenoid parallel to the joint surface down to the level of the tape marking three quarters of the anteroposterior distance of the glenoid (see figure 17). 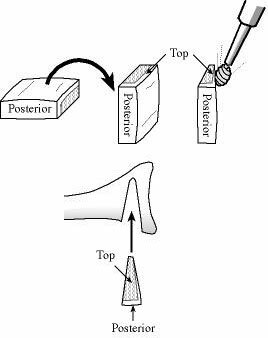 The osteotome is inserted in a posterior inferior to anterior superior direction (see figure 18). The osteotomy is opened by successive prying (see figure 19). 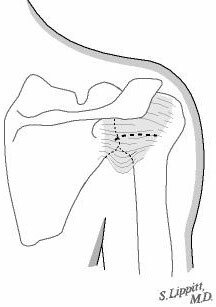 Through the same skin incision a 20 mm by 20 mm by 6 mm bicortical graft is harvested from the posterior acromion using an oscillating saw (see figures 20 and 21). Using a power burr the graft is fashioned into a wedge measuring 20 mm by 15 mm by 5 mm. 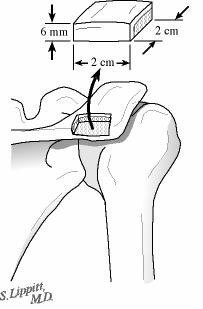 The graft is then inserted into the opened osteotomy at the back of the glenoid (see figure 22). 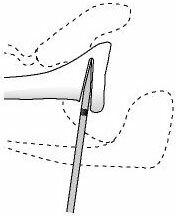 The graft is driven in until it is just below the surface of the bone of the glenoid--this securely locks it in place (see figure 23). The capsule split is closed reinforcing any weaknesses. 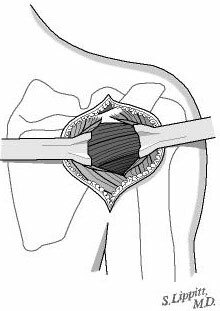 The deltoid split is repaired side to side and any detachment of the deltoid from the posterior spine of the scapula is repaired to bone. A cosmetic closure of the skin incision is carried out dressings are applied and the arm is placed in a sling. Posterior glenoid osteoplasty is performed under a general anesthetic. 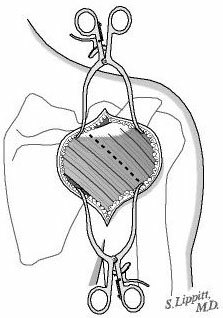 A brachial plexus nerve block may be administered as an adjunctive anesthetic and to provide anesthesia for several hours after the surgery. The patient may wish to discuss their preferences with the anesthesiologist before surgery. Posterior glenoid osteoplasty usually takes approximately one hour but the preoperative preparation and the postoperative recovery may add several hours to this time. Patients often spend two hours in the recovery room and about two days in the hospital after surgery. Recovery of comfort and function after posterior glenoid osteoplasty continues for many months. Shoulder instability surgery is a major surgical procedure that involves cutting of skin and removal of scar tissue as well as suturing of tendons and bone. The pain from this surgery is managed by the anesthetic and by pain medications. Immediately after surgery strong medications (such as morphine or Demerol) are often given by injection. Within a day or so oral pain medications (such as hydrocodone or Tylenol with codeine) are usually sufficient. Initially pain medication is administered usually intravenously or intramuscularly. Sometimes patient controlled analgesia (PCA) is used to allow the patient to administer the medication as it is needed. Hydrocodone or Tylenol with codeine are taken by mouth. Intravenous pain medications are needed usually for only the first day or two after the procedure. Oral pain medications are needed usually for only the first two weeks after the procedure. Pain medications can be very powerful and effective. Their proper use lies in the balancing of their pain relieving effect and their other less desirable effects. Good pain control is an important part of the postoperative management. Pain medications can cause drowsiness slowness of breathing difficulties in emptying the bladder and bowel nausea vomiting and allergic reactions. Patients who have taken substantial narcotic medications in the recent past may find that usual doses of pain medication are less effective. For some patients balancing the benefits and side effects of pain medication is challenging. Patients should notify their surgeon if they have had previous difficulties with pain medication or pain control. After surgery the patient spends about an hour in the recovery room. A drainage tube is sometimes used to remove excess fluid from the surgical area. The drain is usually removed on the second day after surgery. Bandages cover the incision. They are usually changed the second day after surgery. Patients are discharged as soon as the incision is dry the shoulder is comfortable with oral pain medications the patient can perform the range of motion exercises the patient feels comfortable with the plans for managing the shoulder and the home support systems for the patient are in place. Discharge is usually on the second day after surgery. Walking and use of the arm for gentle activities (with the elbow at the side) are often encouraged soon after surgery but the surgeon should be consulted for the specifics of each individual case. Gentle activities of daily living are often permitted with the operated arm; however lifting anything heavier than a cup of coffee or using the arm for forceful activities must avoided for six to twelve weeks depending on the procedure. Management of the patient's limitations requires advance planning to accomplish the activities of daily living during the recovery period. Patients may require some assistance with self-care activities of daily living shopping and driving for about one month after surgery. Recovery of comfort and function after shoulder instability surgery continues for many months after the surgery. Improvement in some activities may be evident as early as three months. With persistent effort patients make progress for as long as a year after surgery. A progressive rehabilitation program after posterior glenoid osteoplasty is critical for achieving optimal shoulder function. For the first six weeks the elbow is not allowed away from the side but rotational stretching and strengthening exercises are carried out. Shoulders may become stiff after surgery so early protected motion is often suggested. However the repair needs to be protected from re-injury especially during the healing period. Using the ï¿½rotator cuff onï¿½ technique described above enables the patient to begin strengthening exercises immediately after surgery. Depending on the nature of the procedure the surgeon will often prescribe some gentle motion exercises within a limited range of movement. The surgeon often wishes to check the mobility of the shoulder two or three weeks after surgery to assure that the shoulder has not become too stiff. It is often most effective for patients to carry out their own exercises so that they are done frequently effectively and comfortably. Usually a physical therapist or the surgeon instructs the patient in the exercise program and advances it at a rate that is comfortable for the patient. For the first six weeks after surgery emphasis is placed on protected motion. For the second six weeks emphasis is placed on strengthening exercises to so that strong muscles will protect the shoulder as it returns to normal activities. The patient is asked to carry out exercises to maintain flexibility by carrying out specific yet simple exercises beginning immediately after the surgery (see figure 24). At the end of six weeks and after a comfortable rotation and strength have been achieved the patient starts using the arm out to the side and then in increasingly forward positions as specified by the surgeon. The strengthening exercises are continued for a year after surgery to optimize the dynamic stability of the shoulder. Can rehabilitation be done at home? In general the exercises are best performed by the patient at home. Occasional visits to the surgeon or therapist may be useful to check the progress and to review the program. Patients are almost always satisfied with the increases in range of motion comfort and function that they achieve with the exercise program. If the exercises are uncomfortable difficult or painful the patient should contact the surgeon promptly. This is a safe rehabilitation program with little risk. In general patients are able to perform gentle activities of daily living with the operated arm at the side starting two to three weeks after surgery. Walking with the arm protected is strongly encouraged. Driving should wait until the patient can perform the necessary functions comfortably and confidently. This may take up to one month if the surgery has been performed on the right shoulder because of the increased demands on the right shoulder for shifting gears. With the consent of their surgeon patients can often return to activities such as swimming golf and tennis at six months after their surgery. Stressful activities and activities with the arm in extreme positions must be avoided until six months after the surgery and then only if the shoulder is comfortable and strong. Patients should avoid activities that involve major impact (chopping wood contact sports sports with major risk of falls) or heavy loads (lifting of heavy weights heavy resistance exercises) until one year after surgery and until the shoulder has excellent strength and range of motion--essentially equivalent to the opposite side. In this way the risk of re-injury is minimized. The surgeon and therapist should be able to provide the information on the usual cost of the rehabilitation program. The program is quite cost-effective because it is heavily based on home exercises. In the hands of an experienced surgeon posterior glenoid osteoplasty can be a most effective method for restoring comfort and function to a shoulder with recurrent posterior instability dislocations or apprehension in a healthy and motivated patient when these symptoms do not respond to a supervised exercise program. The best results are obtained when the surgery restores a deficient posterior lip to the shoulder socket (glenoid). In this situation the surgeon has a good opportunity to reconstruct the specific abnormality causing the instability. Pre-planning and persistent rehabilitation efforts will help assure the best possible result for the patient.